COLUMBIA, S.C. — Sen. Bernie Sanders doesn't sugarcoat what happened here the last time he ran for president: "We thought we could do respectably in South Carolina, and we got decimated." That's what Sanders wrote in his 2016 campaign memoir, and as the Vermont independent prepares to potentially make another bid for the White House, he knows he'll have to do better with black voters here — and everywhere. African-American voters were Sanders' demographic Achilles heel against Hillary Clinton. "You've got to win black voters to win the primary," said Lawrence Moore, a former Sanders delegate to the Democratic National Convention who co-founded the South Carolina chapter of Our Revolution, a group that spun off from his campaign. "It took him a while to grow into it and learn the issues, but he's willing to listen and understand, unlike a lot of other politicians." Clinton beat Sanders three-to-one in South Carolina, where African-Americans made up about 60 percent of the vote. And she went on to rout him by similar margins across the South. So it was not obvious that Sanders would make South Carolina his first stop in any of the early primary states this year. 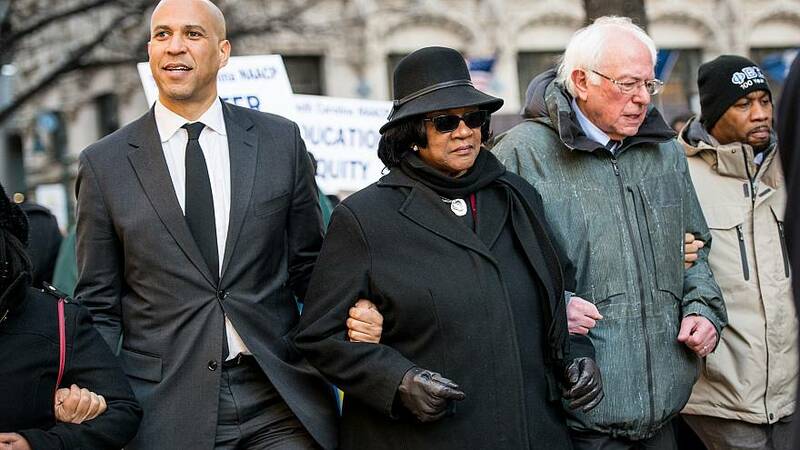 But there he was Monday, marching arm-in-arm through downtown Columbia with NAACP leaders on Martin Luther King Day, calling President Donald Trump "a racist," and visiting black churches and a historically black college more than a year before any votes will be cast in the primary. "He really struggled the last time," House Majority Whip James Clyburn, D-S.C., the most powerful Democrat in the state, said Monday. "I think coming here today is a good start." Sanders waited to visit the state in the last presidential primary contest, and that wasn't the only change observers noticed. Sanders was sometimes criticized — and even protested — by racial justice advocates who said his class-based view of the world missed the struggles unique to people of color. And even supporters were frustrated that he seemed allergic to talking about himself, including his activism and arrests in the Civil Rights movement. But as he spoke with mostly black audiences in Columbia and Florence this week, Sanders opened up about his personal experiences traveling as a college student to see King's "I Have a Dream" speech in Washington. And he drew heavily in his remarks on King's work on economic justice. "Combating racial equality must be central to combating economic inequality," Sanders said. Marcus Terrell, who was the director of African-American outreach for Sanders' 2016 campaign, said he was pleased to see the senator making an early play in the South. "It's obvious to me that Bernie is not going to make the same decisions that he made last time," Terrell said. "There were a lot of things that they could have done differently last time." "He was very well received. He talked about the things that I think are important to all of the members," said Democrat Todd Rutherford, the minority leader of the state House. But Monday also offered a reminder of the new challenges Sanders would face with black voters. Sen. Kamala Harris, D-Calif, has already announced her candidacy, while Sen. Cory Booker, D-N.J., who has not yet declared his 2020 intentions but is expected to run, marched alongside Sanders in Columbia and was constantly stopped for selfies and handshakes. "The math gets really complicated for him," said Antjuan Seawright, a South Carolina-based Democratic consultant. "For the first time in my lifetime, we have a chance to vote for a qualified African-American woman," said Seawright, who is 33, referring to Harris, before also mentioning Booker. "There will be a fight like no other to grab the momentum of the African-American community and their vote." 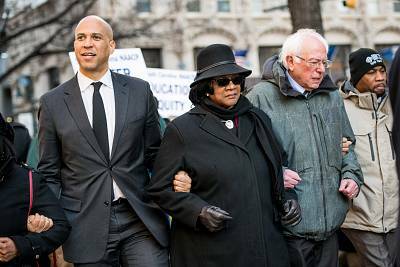 Sanders' struggles with people of color have been top of mind for many supporters who hope he runs and was alluded to on several occasions on a recent online meet-up of backers across the country. "Some people say the political revolution missed the black community. Sometimes, I think the black community missed the political revolution," said Roy Tatem, who worked on Sanders' campaign, and is the president of the East Valley NAACP in Arizona. Many Sanders supporters say black voters simply weren't exposed to his message in the shadow of Clinton. Since then, his visibility and popularity have grown — a Quinnipiac poll last year even showed Sanders with a higher net favorability rating among African-Americans than Oprah — but what happens to those numbers if Sanders gets in the race again is anybody's guess. Cori Bush, who has mounted several insurgent progressive campaigns in Missouri, said she "took a lot of crap for being a black woman standing with Bernie Sanders." "I still do today," she said on the "Organizing for Bernie" livestream. "Now the stakes are even higher."